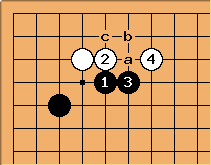 In 3-4 point low approach diagonal, it was mentioned that should be played at . Now that White has played at , has to be played at . Where should Black play after ? 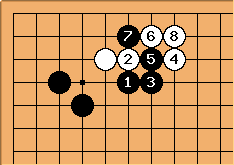 One may want to compare the above with the 3-5 point low approach, press joseki. Is Black a, White b, Black c a problem? 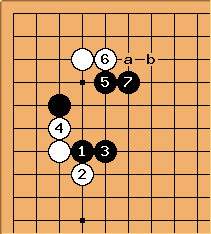 Also compare with the joseki mentioned in 3-4 point low approach one-space low pincer contact on top. Is at a or b, and why?